Tue, Feb 12, 2019, 08:43 pm SL Time, ColomboPage News Desk, Sri Lanka. 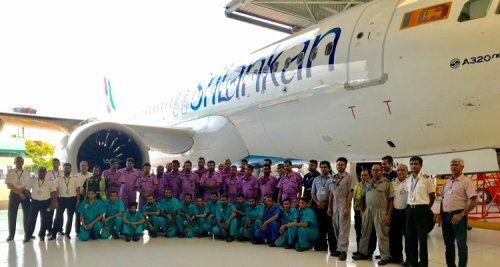 Feb 12, Colombo: SriLankan Engineering, the aircraft Maintenance-Repair-Overhaul (MRO) arm of Sri Lanka's national carrier, achieved another milestone when it successfully carried out its first C-check on an Airbus A320neo aircraft of the SriLankan Airlines fleet at its main hub at Colombo's Bandaranaike International Airport (BIA). Vipula Gunatilleka, Chief Executive Officer of SriLankan Airlines, said: "The highly dedicated and talented Engineering team worked tirelessly to achieve this milestone and once again has strengthen our position as an MRO in the South Asian region. We look forward to provide MRO and engineering services to our customer airlines as well in the near future." D.A.G. Jayasuriya, Chief Technical Officer of SriLankan Airlines said: "Our team of experienced aircraft engineers proved its capabilities once again with this excellent performance. The on-time completion within the planned four day period ending on 5th February ensured that the aircraft was back in service with the fleet within a very short time." SriLankan Engineering holds certifications from the European Aviation Safety Agency (EASA) to carry out Base Maintenance operations on aircraft of the Airbus A320 and A330 families as per EASA Part-145 specifications. It also possesses EASA certifications for its Line Maintenance and Engineering Workshops, and carries out EASA certified Training. Its main facility at BIA recently underwent a significant modernization program that included enlargement of the floor area in its main hangar to allow more aircraft to be served simultaneously; and enclosing of the main hangar with a hangar door to allow programs to be carried out in any type of weather. Significant enhancements were also carried out on its A320 aircraft hangar. The C-check, which is a maintenance program carried out every 4,000 flying hours of an A320 aircraft, was completed on aircraft 4R-ANA, the first A320neo to join the SriLankan fleet. The 'neo' - which stands for New Engine Option - is a range of aircraft from Airbus Industries that are among the most sophisticated in the sky, incorporating a number of advanced features in comparison to the earlier generation of aircraft. The SriLankan fleet includes two A320neo and four A321neo aircraft, all of which are medium-range aircraft, together with its fleet of long haul A330 aircraft. The neo aircraft have been designed to provide significantly lower fuel consumption and lower operating costs through more modern engines, aerodynamic refinements, large curved winglets (sharklets) and weight savings. They also feature cabin improvements such as more passenger seats, larger hand luggage spaces and an improved air purification system, as well as reduced engine noise levels and a significantly increased flying range. SriLankan's route network covers 111 cities in 48 countries. As a member of the oneworld global airline alliance, SriLankan also connects its passengers to oneworld's worldwide network of more than 1,000 destinations in 160 countries.